I've been experimenting with wrapping bones with different types of cord, string, or wire to alter the sound. It generally quiets them, removing some high "clicky" overtones, and gives a rounder, warmer sound. It doesn't carry as well, especially outside, but sounds good with quieter, slower songs. The sound is also less wearying when you're practicing. It does make the bones somewhat heavier and slower, but if you have a set that's light and piercing sounding, wrapping them can transform them from an annoying instrument into one you'll want to play. Let me know if you have any questions, or make any interesting discoveries -- my email address is on the home page. I'd love to hear recordings of people playing their wrapped bones! The way I wrap them uses only friction to keep the wrappings in place -- there's no glue or extra hardware to hold the cord on the bone. For this pair, I used one millimeter thick leather cord that I got from a fabric store, about $2.50 for a 12-foot length. 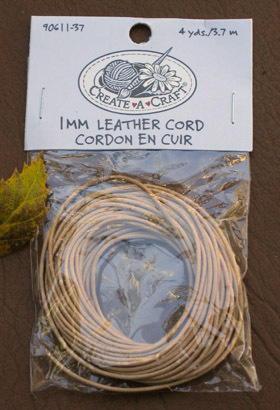 Look in the jewelry-making section, cord like this is used for making necklaces and the like. 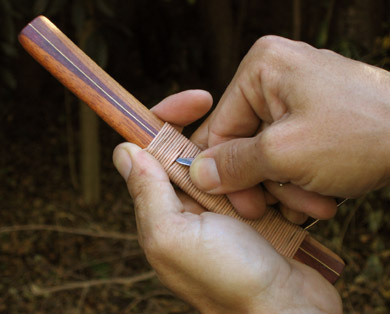 The leather gives a warm, natural sound, but retains a good attack since it's thin and dense. 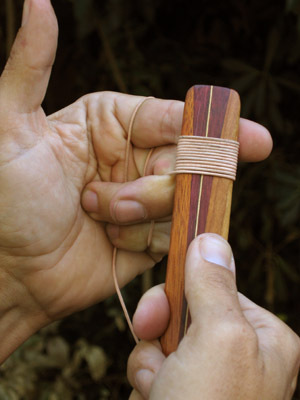 Take one end of the cord, and hold it down the middle of the side of the bone which curves inward. This will be on the outside as the bones are held to play -- not on the side of the bones which strike each other. 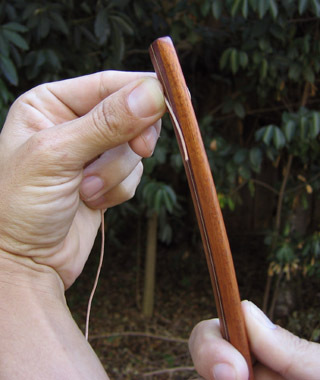 Holding the end of the cord tightly with one thumb, wrap the cord around the bone, overlapping the cord. Wrap it tightly, holding the cord very taut. 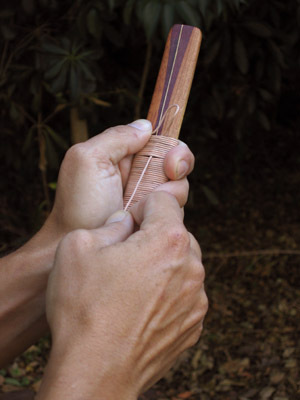 After you make three or four winds, the cord will hold firmly. You can start nearer the end of the bone if you want, but this leather cord is only 12 feet long, so I have to start a bit higher to get it to go far enough up the bone. 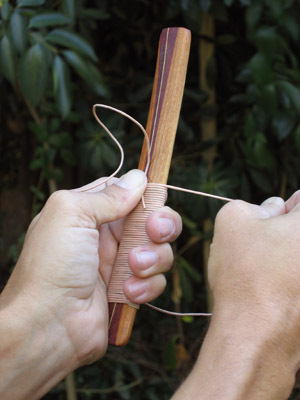 I like to turn the bone in one hand, while I keep tension on the cord by lacing it through the fingers of my other hand. 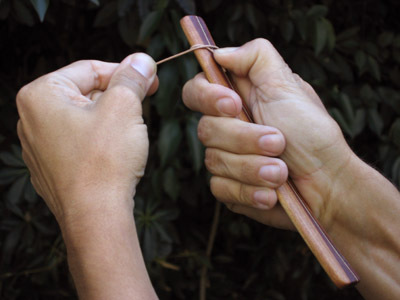 The cord stays tight as you wrap up the bone. 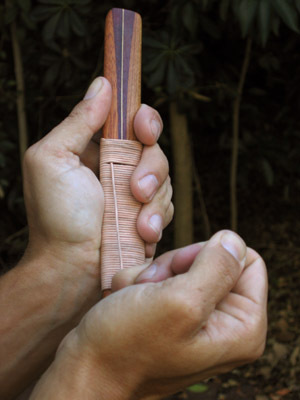 Keep the wraps as close together as possible. 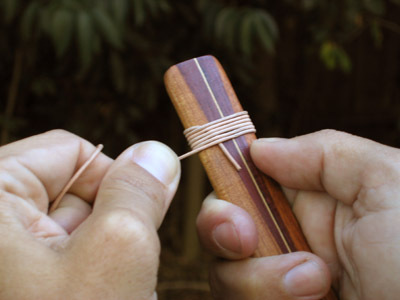 Occasionally pushing the most recent wraps towards the others with your thumb helps keep them tight. 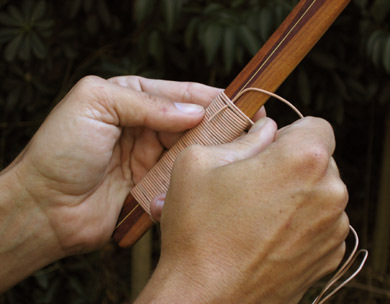 When you near the end of how far you want it wrapped (when there are seven or ten windings left), bring the other loose end of the cord around over the windings, on the same side as before (the non-striking side), and hold it down the middle of the bone with your thumb. 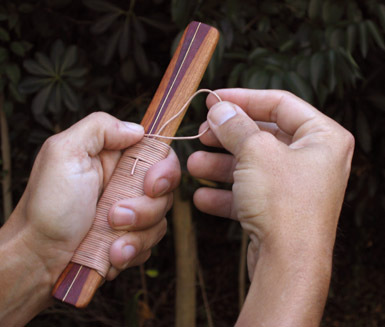 Continue winding over the free end, pulling the loop over the top of the bone for each wind. Keep it tight. 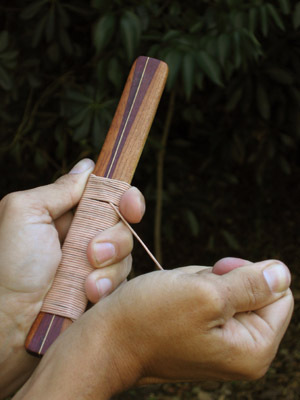 When you get to the last winding, loop it over the top of the bone. 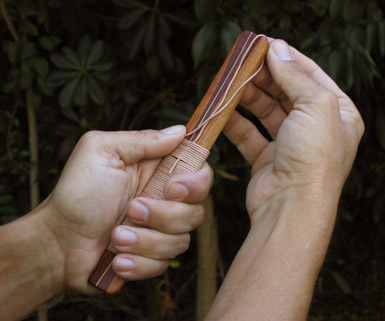 Hold the last winding tightly with your thumb. Pull the loose end through the last windings, until there's no slack. Make sure the last winding doesn't slip down over the previous winding. 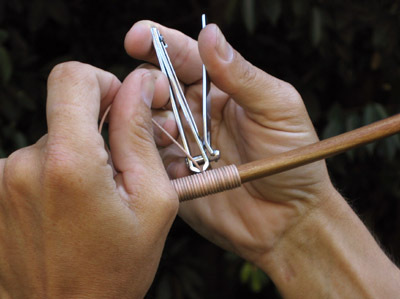 Pull the loose end diagonally through the last windings, pulling it very taut. 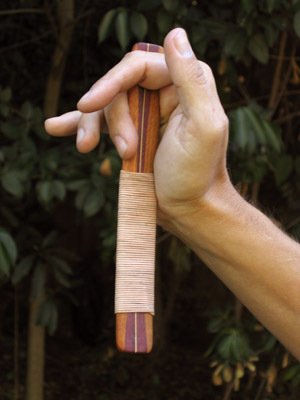 Now you can release the thumb holding the last winding. Pull the cord straight down the bone, near the side. Pull it tight, but at this point you don't have to force it. Use a nail clipper or a small pair of scissors to clip the cord as close to the windings as possible. 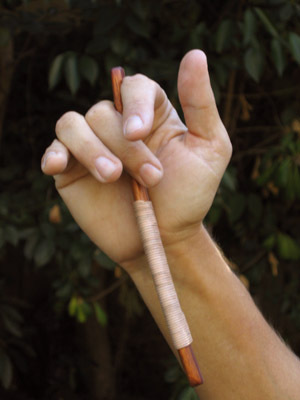 Push any end sticking out towards the center of the bone with a thin instrument or your fingernail. It should slip under the winding just above it to cover it up. Compress the windings top-to-bottom, to make sure there are no gaps. The bone is now finished and ready to play. 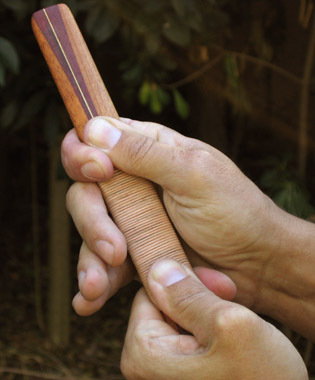 Some windings extending into the palm is normal, otherwise you get occasional wood-to-wood contact as you're playing, especially if you kick the bones apart and play the edges. Of course, if that's a sound you want to experiment with, use less wrapping.